Designer-made solid 14 carat gold chains. Sets your Hawaiian jewelry off beautifully. 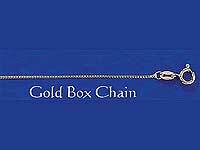 Box Chain - Solid 14 carat Rose Gold - 40cm - 16" Box Chain - Solid 14 carat Rose Gold - 45cm - 18" Box Chain - Solid 14 carat White Gold - 40cm - 16" Box Chain - Solid 14 carat White Gold - 45cm - 16"
Box Chain - Solid 14 carat Yellow Gold - 45cm - 18"